For all those of Celtic heritage, be ye Irish, Scots, Manx, Welsh or Breton, these Celtic embroidery designs are a way of showing pride in the heritage and style of being a Celt. 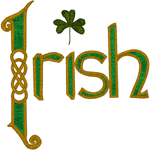 Here you'll find distinctive Celtic crosses, Celtic knots, Celtic shapes and Celtic symbols. Enjoy!